Brooklyn, NY - A Brooklyn artist is reportedly behind a headstone bearing Donald Trump’s name that was placed in New York’s Central Park earlier this year. 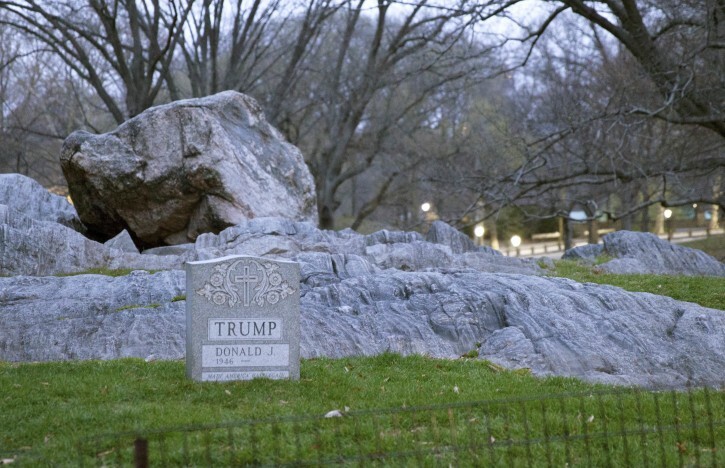 The New York Times reports (http://nyti.ms/1Npa9lV ) the headstone included Trump’s birth year, 1946, and the epitaph “Made America Hate Again.” It mysteriously appeared in the park on March 27 before being taken away by parks department workers. Police tracked the stone to a monument dealer who gave them the customer’s name and security camera footage showing him loading it into a truck. The Times says police have identified the man as Brian Whitely. He hasn’t responded to requests for comment from The Associated Press. Bernie Sanders at work again! honestbroker = lover of every demeaning stereotype imaginable. No wonder he loves Trump. Oh, those loving liberals got themselves busy again... Losers.